First, a small disclaimer: No matter how you slice up conferencing solutions, the categories you use to group them are mutable and subject to instant revision. Combinations of various elements make some applications basically impossible to categorize. Depending on how you look at it mail lists are even a form of conferencing and so is email. Real-time versus asynchronous is even becoming blurred as text, audio and video merge in varying combinations. That said and out of the way, lets look at some of the ways conferencing solutions are categorized. 1. Real-Time Conferencing. Real-time conferencing refers to synchronous communications such that the participants are concurrently virtually present and able to actively interact as if they were physically co-located. Some typical and common applications are instant messaging and interactive chat, participatory webinars, interactive webcasting, online interactive teleseminars. Now these are primarily web-based, however the old-time telephone conference call is still widely used. Call-in teleseminars are also common. Today however, they are merging into web applications as VoIP services with gateways into landline telephone systems become widely available. 2. Video conferencing is generally considered separately because it is a far more bandwidth intensive activity. To achieve reasonably acceptable simultaneous live video and audio, you need serious bandwidth. And the more active participants involved the more serious the problem becomes. Internet chat services with webcams are one rather simple form of video conferencing that's quite popular for individual person-to-person links, but clearly not of sufficient quality to use for business purposes or for larger groups. Some video conferencing is one-way video with interactive audio. Others require high-speed networks or dedicated connections. High-end solutions may work well for large corporations because of the savings involved in reducing travel expenses and time lost from productive work. 3. Forums, message boards, bulletin boards and so forth. These are asynchronous forms of conferencing or discussion solutions. Even blogs and wikis may, at times fall into this category. Generally these are linear or threaded, topic centered meeting places with chronologically tagged sequential entries that make up a discussion. Some prefer the linear mode as being easier to use and follow while others insist that threaded tree-like structures often more scope and the ability to develop sub-topics integrated into the main topic. Whatever one’s preference, these are excellent solutions given the nature of the evolving internet and the need for participation by persons in time zones spread across the world. Real-time communications can be a burden when day/night cycles are offset by large amounts. Forums, with their purpose centered focus can develop extensive and dedicated communities which can be a source of extremely valuable knowledge and experience. 4. Collaborative team- or group-based work environments. These kinds of solutions can also include on-line virtual classrooms in several forms. The most sophisticated of these solutions include both real-time and asynchronous modes with audio, video, messaging and conferencing built-in. While some of this software is in use over the internet (again, some collaborative workspaces have been developed based on blogging platforms and even forum software is sometimes used this way), the more resource intensive versions are generally used on dedicated networks and intranets with high bandwidth. Many of these applications are oriented more toward in-house corporate uses. So, do you suppose this covers it all? Just those four areas reflect a huge growth of the available modalities for conferencing and meeting over only a few years ago. Remember the old landline conference call? Once it was a major deal to be able to add a third person to a phone call. Now you can spend months just researching available solutions. And this really doesn't even touch systems such as desktop video conferencing, the extensions of phone conferencing and the interaction of VoIP (Voice over Internet Protocol) services with all forms of web conferencing. Attending teleseminars in foreign countries, once prohibitively expensive for many, is now an accessible alternative with low-priced VoIP gateway services that allow fixed price calls to any landline or mobile phone. As internet service continues to increase in speed and decline in price, the utility of these kinds of conferencing solutions will continue to expand. The growth of the cybersphere and the elaboration of purpose driven and affinity communities on the internet will continue to drive the development and integration of conferencing and communication software and services. In a very real sense conferencing software is at the heart of the new realities that the explosive growth of internet usage in every corner of the world is creating. These are social applications and they are changing how people live, interact and view each other. There is yet another form of widely used "conferencing" software which is rarely mentioned in this connection. Multi-user, real-time, online games of all types from role=playing to live gambling (play poker with your friends, live roulette, etc.). Some of these systems are highly sophisticated and a lot of people love them. Their attraction lies not only in the ability to vicariously be someone (or something) else or to do things that may not be available locally, but in the social interactions and the communities that develop. While surfing is pretty much an unsocial activity, people are social creatures and the popularity of all types of solutions offering interactive contact and a sense of community reinforces this. Marketing use of audio conferencing in the form of teleseminars and pre-recorded audio streams have undergone tremendous growth in the last year alone. Bandwidth still limits the quality of the video that's often used with pre-recorded audio to fairly static material. But this is changing as compression and streaming technologies improve. The major breakthrough that's still to come is the technology to effectively and affordably do, first, one-way live high quality video and beyond that live interactive multi-way video over the internet. If it seems like a difficult, perhaps impossible task, think again about what’s happened in the last five years. And the future is arriving faster all the time. Richard writes, teaches, trains and consults on business and professional presentations and eCommerce related matters. 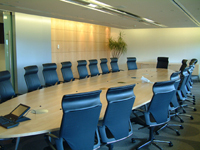 For more information on web conferencing, VoIP, conference calling and related subjects visit http://altaglobal.com - find more on wireless and cellular subjects at http://www.altaglobal.org and check http://www.altaglobal.net for networking and security.